We welcome the oral update by the Independent Expert on Central African Republic and look forward to reading her full report when finalized. EAFORD and Geneva International Centre for Justice remain concerned with the human rights situation in CAR as recent reports have illustrated continued grave violations including gender-based violence, child combatants, and attacks and killings on civilians some of which have been attributed to intercommunal violence. We are also concerned about attacks on peacekeepers and the continued cross-border trafficking of weapons. As noted by the UN High Commissioner for Human Rights, Mr. Zeid Ra’ad Al Hussein, and the independent expert, Ms. Bocoum, hate speech and the incitement of violence has provoked and sparked numerous instances of violence against particular groups on the basis of ethnicity and religion and to manipulate and deceive the population. Such issues in consideration of addressing root causes must be seriously looked into and concrete measures must be put into place to combat hate speech and the incitement of violence. In addition, practical steps and examples of best practices towards the promotion and protection of human rights and solidarity requires the assistance and support of this Council and the international community. In light of the deteriorating situation in CAR impunity persists and efforts to provide adequate protection and justice towards the victims is much too slow. To this end, victim and witness protection strategies, disarmament, truth and reconciliation initiatives, and peace and security measures urgently require technical assistance and the full and effective participation of women and the voices of grass roots organisations. 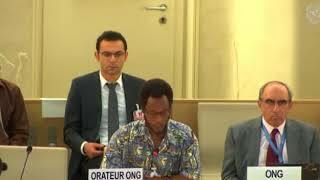 In conclusion, we would like to ask the independent expert what specific measures towards combatting hate speech and incitement to hatred and violence would be most effective in Central African Republic and what assistance can the international community provide towards achieving positive results in this regard?